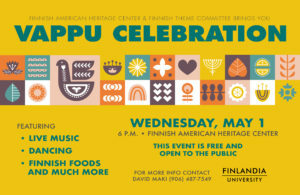 Vappu (May Day) Celebration hosted by the Finnish American Heritage Center and Finnish Theme Committee on May 1 from 6-8pm. Community picnic event with light refreshments provided by the Finlandia Dining Services and a dance band. We will also be celebrating the former Hankookin Heikkis. Students, employees, and local community members are all invited.